Do you know how to park your car? Strange question, isn’t it? You’ve been driving for 5, 10, 20 (insert your number here) years, sure you know how to park! Or do you? The other day I went to get a few things for dinner and was amazed by the number of people who have no idea how to park. What I found interesting, is that people know that what they are doing is wrong, I’ve observed a few of them getting out of their cars, “admiring” their parking, guiltily looking around, as if checking “have I been caught out?” and walking away with a smug expression on their faces. So why do people do it? Why do they ignore the rules, ignore the fact that they inconvenience other road users? Why do otherwise intelligent people commonly failing at this simple task? Example of less than perfect parking. Part of the blame is resting with the local council. Their lack of policies creates and encourages the wrong behaviour in people. Our local city council has given away way too many permits for new apartment blocks, and as the result of it, population (and the number of cars) exploded, without any additional parking spaces being created. People get really excited when they do find a spot, and forget about small, not important stuff, like parking between the lines, following the basic rules…. I guess what I’m saying is this: I am not a whinger, but….unless you want your parking spot to warrant a special designation like the one below, PARK BETWEEN THE BLOODY LINES! 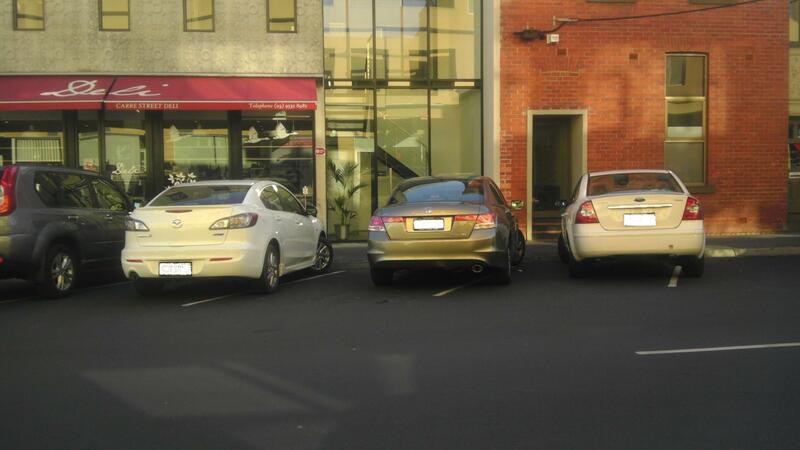 This entry was posted in Local Issues and tagged accountability, auto, city council, glen eira, parking by Eugene. Bookmark the permalink.